Overview - Through the eyes of Daniel Domscheit-Berg, an early supporter and eventual colleague of Julian Assange, the film follows the heady, early days of Wikileaks to its abrupt end after a series of controversial and history changing info leaks. The website's overnight success brought instant fame to its principal architects, but as their power expanded across the globe, Daniel grew increasingly disillusioned with Julian's questionable tactics and ethics. The rift between the two friends became irreparable and their ideological differences tore them apart, but not before they revolutionized, for better and worse, the flow of information to news media and the world at large. Special Features: The Submission Platform - Visual Effects: From conception and pre-viz, through on-set photography and post, this featurette will explore the VFX challenges of bringing the submission platform to life. In Camera: Graphics: A study of the techniques and work involved in capturing the on screen graphics in camera, and allowing realistic interaction with the actors' performances. Scoring Secrets: A detailed examination of the soundscape created by both the composer Carter Burwell as he records his score, and the film's music supervisor as songs are chosen for the unique soundtrack. Despite varied opinions on the subject, the ongoing WikiLeaks saga has had an undeniable effect on our global culture, setting off far-reaching consequences and fascinating implications that continue to develop in both positive and negative ways. Positioned toward the center of the world's constantly evolving cycle of digital information distribution, the website's genesis and infamous founder remain the perfect fodder for a great "ripped-from-the-headlines" thriller. 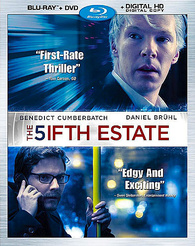 Sadly, however, Bill Condon's 'The Fifth Estate' is not that great thriller. Instead, it's just a mediocre one. Clumsily structured, stylistically clunky, and broadly scripted, the film never manages to find a truly compelling focus, squandering some legitimately interesting material on second-rate drama. While the veracity of the script continues to be hotly debated, fact or fiction -- the end results just aren't terribly interesting, leaving audiences with an ostensibly provocative film that fails to really provoke on any level. Well, that is, unless you happen to be Julian Assange. Based on real events, the story focuses on the founding of WikiLeaks, a website that publishes corporate and government leaks while promising to protect the anonymity of its whistle blowers. We primarily follow Daniel Berg (Daniel Brühl), a journalist who becomes enamored by the enigmatic Julian Assange (Benedict Cumberbatch), the creator of WikiLeaks. Together, the two help to grow the website and develop a close friendship. But when Assange's ethics and motives seem to waver, Berg starts to question his allegiances. Torn between a desire to expose the truth and a duty to adhere to some form of journalistic integrity, Berg will have to decide if WikiLeaks and its founder are really on the right path. The script starts off in 2010 with the massive leak of the Afghan War Logs, but we quickly backtrack to 2007 when Berg and Assange first meet and team up. While Assange remains a central figure throughout the story, it's actually Berg who becomes the narrative's real protagonist. To this end, the young journalist serves as the audience's viewpoint into Assange's world of hacking, leaks, and digital espionage. Their growing and eventually dissolving friendship also serves as the emotional core of the story, bolstering the movie's standard political thriller beats. Unfortunately, the film has a hard time finding an engaging focus, and the first half of the runtime is rather listless and disjointed. We move from point to point, tracing the gradual growth of WikiLeaks while simultaneously addressing Berg's struggles to have a personal life -- but these elements are all underdeveloped, scattered, and skimmed over. Thankfully, a more cohesive plotline emerges once we catch up to the events surrounding the Afghan War Logs leak, but even then, the film never delves deep enough into its subjects. Instead, we simply get lots of scenes featuring Berg and Assange typing on their computers while the government starts to freak out. To their credit, the filmmakers do make a solid effort to try and spruce up these computer coding sequences with some cinematic effects work, but these efforts rarely pay off. A kind of "virtual office" is created that gives visual form to WikiLeaks' submission and encryption process, but seeing the characters inhabit the virtual space whenever they get behind their computers just starts to come across as unintentionally cheesy. Some less than stellar compositing and CG work doesn't help matters much either. When he's not glued to a laptop screen, Benedict Cumberbatch does turn in a strong performance as the infamous Julian Assange, but the filmmakers' decision to shift the perspective away from the WikiLeaks founder does limit his on-screen characterization. We catch some brief glimpses into his childhood, and while these bits are intriguing, they aren't really expanded upon. In the end, we never really get a full picture of the man -- though what we are shown isn't particularly flattering. In fact, he essentially becomes the movie's third act villain, with Berg positioned as the righteous hero determined to take down his former friend who has become blinded by power and narcissism. Of course, Assange himself has decried the movie's authenticity -- but if the script's heavily critical depiction of him is to be believed, then he, uh, isn't one to be believed. Somewhere lost within its generic thriller scripting and thin emotional drama, 'The Fifth Estate' is actually home to some genuinely fascinating dilemmas related to ethics, accountability, corruption, the fight for truth, and the very way our society consumes information. Where does legitimate secrecy end and criminal conspiracy begin? Is exposing the truth always the right thing to do, even if lives are put on the line? How much information should be made public, and perhaps most importantly of all, who gets to make that decision? These are all truly thought provoking questions that, while present throughout the runtime, are sadly marginalized or too broadly scrutinized. The film ultimately does a decent job of addressing both the positive and negative aspects of WikiLeaks, but it fails to really say anything interesting about those weighty implications, leading to a disappointingly mediocre examination of a continually relevant and important topic. Despite some stylistic flash and a playfully meta conclusion, the movie ends up being a superficially controversial and bland experience. One that even Julian Assange is likely to forget. 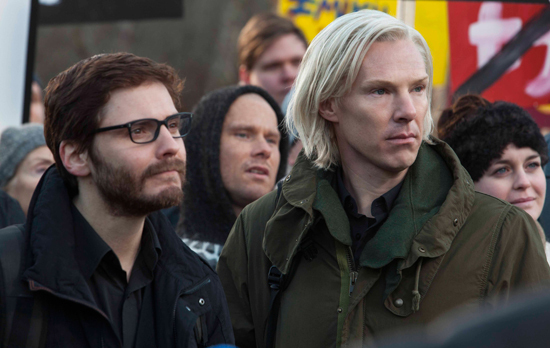 Touchstone presents 'The Fifth Estate' in a Blu-ray/DVD/Digital HD combo pack. A single BD-50 disc is housed in a keepcase with a cardboard slipcover along with a DVD and instructions for a Digital HD copy. After some skippable trailers, the disc transitions to a standard menu. The Submission Platform - Visual Effects: From conception and pre-viz, through on-set photography and post, this featurette will explore the VFX challenges of bringing the submission platform to life. The movie is provided with a 1080p/AVC MPEG-4 transfer in the 2.40:1 aspect ratio. With a fitting style and a predominantly clean image, the film comes to Blu-ray with a pleasing picture. Shot on Arri Alexa cameras, the digital source is crisp and essentially artifact free. With that said, there is some minimal grain-like noise in some shots. Detail is relatively strong but never razor sharp, and some scenes veer toward a comparatively flat appearance. Colors are nicely saturated and adhere to a fairly cool palette, and various neon lights in bars and party scenes pop nicely off the screen. Contrast is well balanced, and while blacks are steady, they do appear a bit elevated in nighttime sequences. Though the picture never exactly wows, 'The Fifth Estate' features a very competent transfer free from any troublesome technical issues. The film is presented with an English DTS-HD MA 5.1 track, and a French and Spanish Dolby Digital 5.1 track along with optional English SDH, French, and Spanish subtitles. Marked by some solid design work and scoring, the mix manages to keep things lively and varied. Dialogue is clear and full-bodied throughout with no balance issues to speak of. Technology plays a huge role in the film, and various effects from computers, phones, and other gadgets are frequently emphasized. Coding and hacking sequences feature enveloping design work, spreading all sorts of digital sounds and voices around the room in an effort to immerse the audience in the characters' virtual office. Outside of these scenes, the track is fairly modest, but standard ambiance like rain and crowds come through well. The movie's techno influenced score also carries strong fidelity, range, and separation, and bass activity kicks in nicely during several scenes set in booming parties. It's not as nuanced or immersive as other tracks, but the mix does a nice job of enhancing the computer heavy content with some creative design work. Touchstone has put together a small but solid collection of supplements, including several featurettes. All of the special features are presented in 1080p with Dolby Digital 2.0 sound and the same subtitle options as the main feature. The Submission Platform: Visual Effects (HD, 10 min) - This is a featurette about the film's effects work. The participants discuss their goal of making computer coding seem cinematic, and trace the design process for WikiLeaks' virtual office. In Camera: Graphics (HD, 6 min) - Here we get a behind-the-scenes look at the practical effects used to make the computer sequences more cinematic and visual. The crew also elaborates on designing the film's various on-screen computer graphics. Scoring Secrets (HD, 9 min) - This featurette focuses on the score by Carter Burwell. The composer discusses the music's techno influences and different styles, and we also get a peek into the recording and mixing process. Trailers & TV Spots (HD, 7 min) - A collection of eight trailers and TV spots is viewable separately or together. 'The Fifth Estate' is a disappointing political thriller that tackles some genuinely fascinating material but fails to delve deeply enough. The WikiLeaks story is full of interesting and continually relevant questions dealing with truth, corruption, and the far-reaching effects of information in the digital age, but sadly the filmmakers only scratch the surface of these intriguing concepts. The video and audio presentations are strong, however, and though relatively slim, the included featurettes provide some solid information about the movie's visuals and music. Though it mostly misses the mark, the script's real-life inspiration remains an interesting story and there are elements of the film that still prove to be compelling. Those looking to learn more about the events surrounding WikiLeaks and its founding (or at least, a dramatized account of those events) will likely still want to give this disc a rent.